The TM-U950 multifunction printer is a high performance 2.5 station printer that is a perfect choice for large POS systems used by mass merchandisers and other large stores. It handles a variety of printing formats including receipts, journals, and slips. 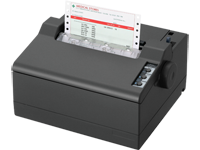 It also offers optional check printing and endorsement capabilities. Epson’s constant innovations in retail printing solutions give you the best performing printer that suit your business requirements. Its 24-pin print head supports printing of Indian texts in high resolution both by the command control and through a Windows® driver. 10 local Indian language device fonts are pre-installed. In addition, it is designed to perform well in dusty or sandy locations. Terima Jual Beli Printer, Service & Spare parts Epson Dot Matrix printer.